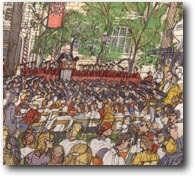 What made the 456th convocation different? The odd thing about seeing famous people on familiar turf is that they end up looking exactly like who they are: famous people on familiar turf. So when President Bill Clinton chose to attend the third session of the Universitys 456th convocationan event more commonly known as commencementthe man on the dais offering a handshake to each fourth-year reaching for a long-sought diploma looked, even when wearing academic regalia, exactly like the man were accustomed to seeing on the cover of TIME, in the morning paper, or on the evening news. But if Clinton looked familiar, in other ways the scene in Harper Quadrangle, where the Colleges graduation ceremonies moved last year after decades in Rockefeller Chapel, was extraordinary. First, there were the six national and local television cameras, the three busloads of print photographers and journalists representing periodicals and wire services from Agency France Presse to Newsweeknot to mention the Magazines illustrator, Mark McMahon (see Campus Sketchbook, page XVI)joining 789 fourth-years, their 5,000 family and friends, and scores of the Universitys faculty and officials on a sauna of a Saturday morning. Then there were the demonstrators. Like the graduates, they started to gather several hours before the ceremony. By half past nine, several hundred stood across 57th Street from Cobb Gate. The issues were contemporary, and so were some of the detailsMuslim girls in head scarves holding aloft posters mounted on cardboard boxes that once held PCsbut in other ways, the atmosphere was vintage Sixties, complete with Joan Baez standards, small children blowing soap bubbles, and long-haired, sandaled protesters walking blithely past the mounted policemen assigned to the scene. Lined up between the metal barricades that channeled, cattle-chute fashion, their route from Bartlett Gymnasium into Harper Quadrangle, the graduates took in the scene, some pulling cameras from under their robes to photograph the demonstrators. Then, about 20 minutes later than originally scheduled, the Alumni Association pipers led the procession into the quads. Once the fourth-years were inside the quadrangles, there was one more realization that it was a day with a difference. The quads were sealed off, guarded at every exit. If you were already inside, you could leave, but you could not return. And the stray tourist, cyclist, or grad student on her way to somewhere else couldnt stop for a moment to imbibe a bit of academic pomp. Next year everything will be back to normal. Convocationbarring life-threatening weather or floodlike conditionswill again be outside as the new tradition marks its third year. Accidental spectators will again drop in. And yet if you discount the security and media hoopla that accompany a presidential visit anywhere, this years College convocation was no moreand no lessspecial than any of those that have been and that will be. Whether the person whose hand theyre shaking as they receive their diploma is the president of the U.S. or the president of the U of C (or both), fourth-years still worry that they might stumble and trip as they take those final few steps. And whether the moment is televised live on c-span or captured only via a parental video-cam, it both lasts too long and is over too quickly. Hail and Farewell. With this issue, the Magazine staff bids goodbye to its 199899 College interns. Matt Bean, 00, and Julie Patel, 00, have written for every department from On the Quads to On the Shelf. Were grateful for their help, their enthusiasm, andnot leasttheir sense of humor.M.R.Y.